Each hero has specific starting structure (which starts on the board), as well as a unique hero ability. Generate resources, which allow you to pay for cards and activate abilities. When you play a worker, you generate a resource, and the worker goes to you mine. At the start of your turn, you generate resources up to the number of workers you have at your mine. (so 5 workers at mine = you can generate 5 resources). Weapons are played on (or attached to) troops you control, and may increase the attack and health of the wielder (or host), which it is played on. 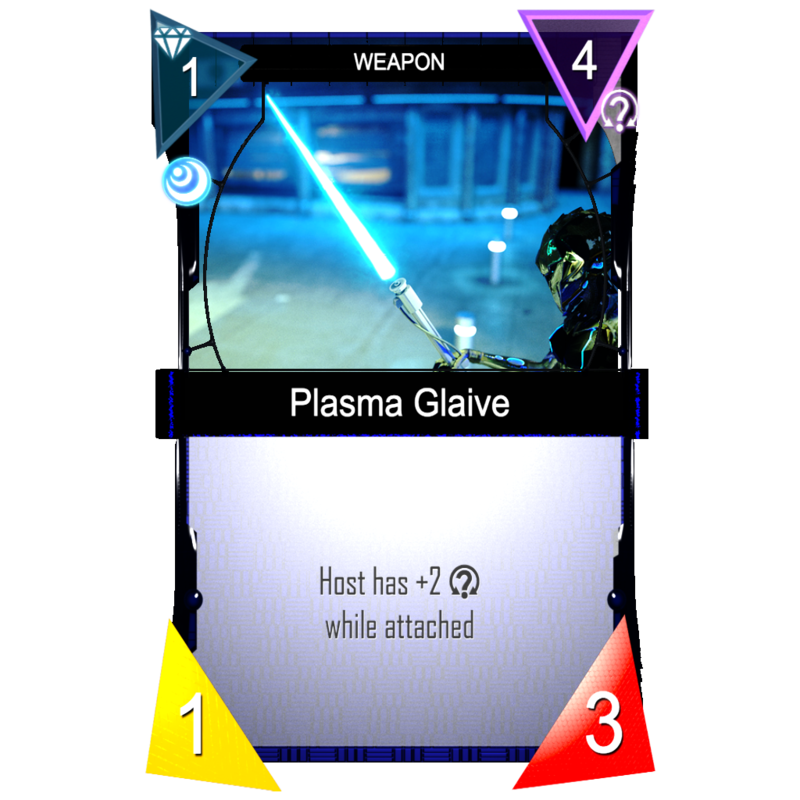 Additionally, weapons often will have a “Fire Weapon” ability, which allows you to deal direct damage to cards in play (or your opponents hero). Weapons you play on your hero, which let your hero attack, and can absorb damage up to the amount of armor the weapon has. Additionally many hero weapons will have a “fire weapon” ability as well. At the start of your turn, you may generate resources equal to the number of workers you have at your mine. When you generate resources, they move from your deck, to your active resources pile. At the end of each players turn, cards in their “spent pile”, are moved back to the bottom of their deck. You may be asking yourself, why would I want to generate less than the number of workers I have at my mine each turn, why offer the choice at all. The answer is, because you often will want to have cards left in your deck, to “Draw Fate”, which we will cover later. During your draw phase (the last phase in your turn), you may draw any number of unspent resources that you have in your active pile. When you draw cards, you are essentially taking damage, so it can be a double edged blade. Additionally, if your life gets too low, you may not have enough cards in your deck to generate as resources to play the cards you need to play. So drawing of cards / managing life in Dark Matter, is an art in unto itself! The cards in your active pile remain once you end your turn. Meaning you can save resources each turn, in order to play an expensive card the next turn, play actions or active abilities during the opponents turn, etc. This is when you play workers, troops, weapons, structures, etc. During your main phase, you can attack with one or more readied troops, by clicking on the troop, and selecting a valid attack damage target (the players hero, or one of their structures). 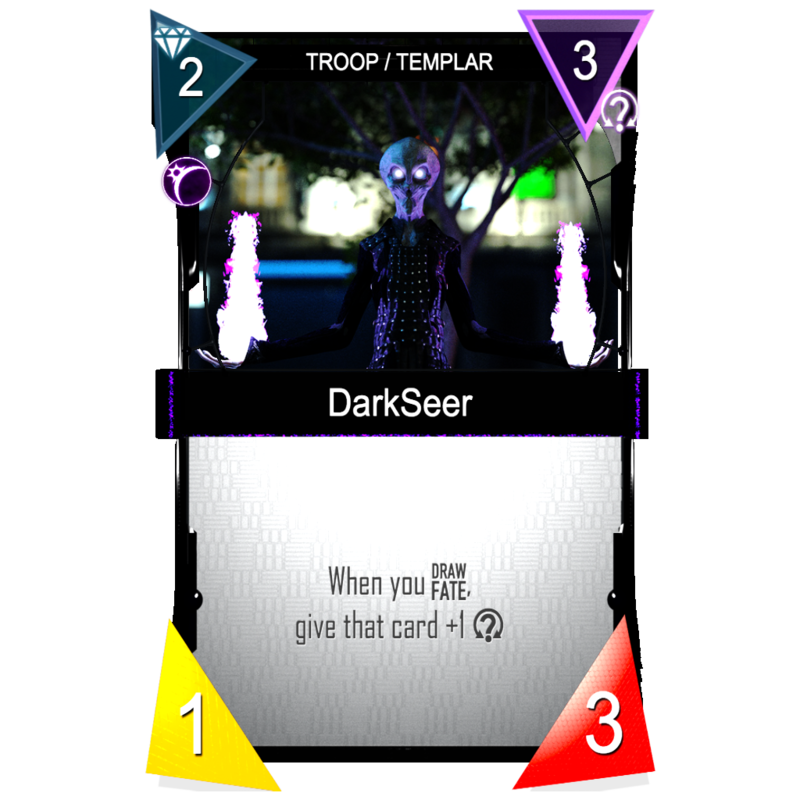 Once you’re done playing cards and/or selecting attack targets, you proceed to the next phase, either Attack, or Draw, depending on whether you selected attackers or not. When you have troops attacking, opponent may block the attacker with any number of readied troops they control, and vica versa. You may draw any number of unspent resources (cards in your active resources pile), during your draw phase, or you may save them until next turn. 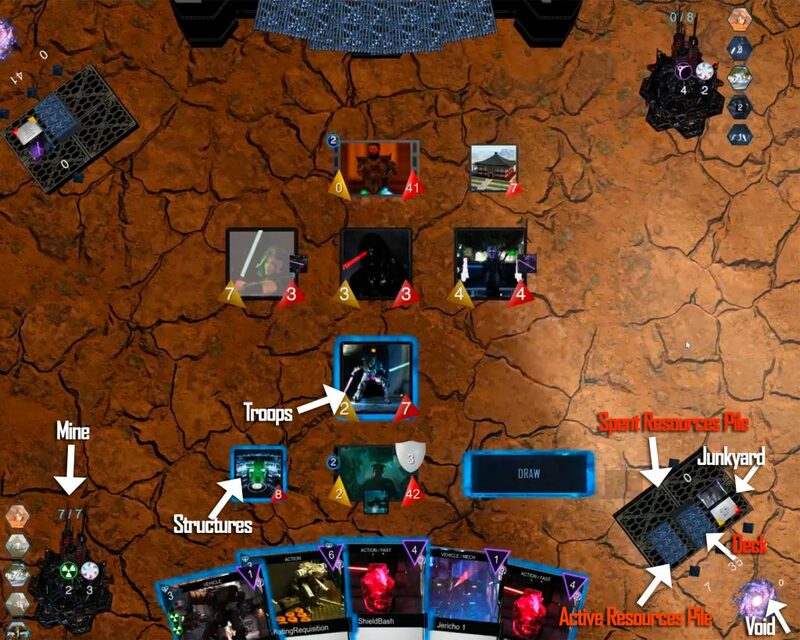 Additionally, you may move up to 1 worker from your mine, to the board, during your draw phase. This allows you to pull your workers out to defend, attack, use abilities, etc. 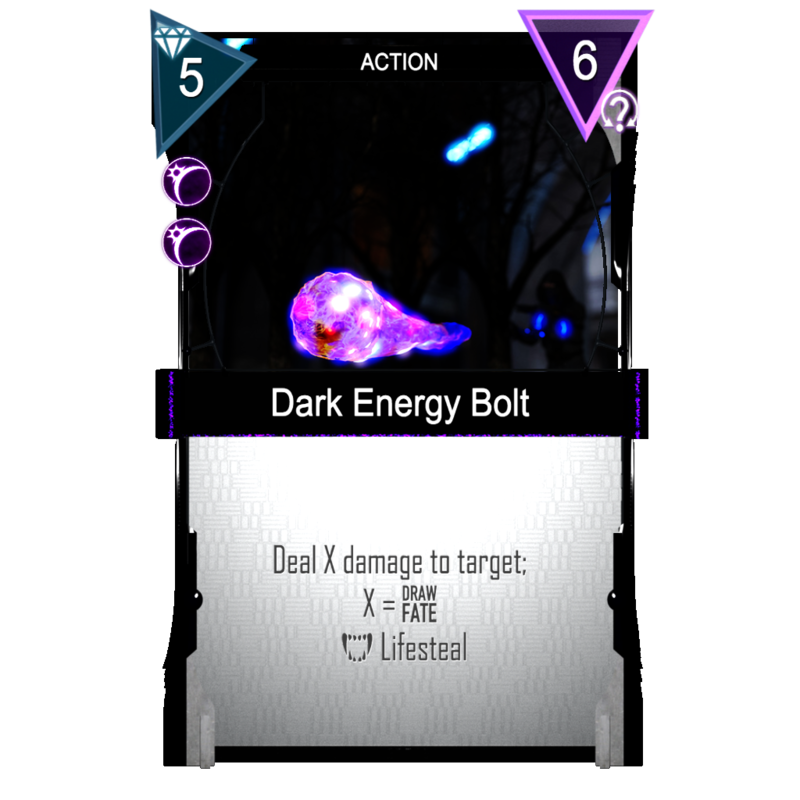 Each card in Dark Matter has at least two attributes, cost, and fate. How many resources the card costs to play. Fate is a multi purpose attribute. It is used when drawing fate (we’ll cover that separately, but it is an important core mechanic). 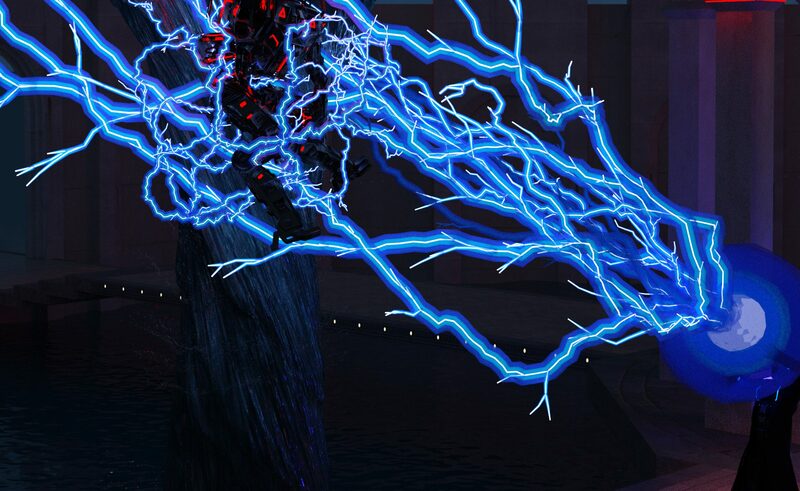 It is also used as a counter, modifier, or power modifier for some abilities. Every time he kills an opposing card (troop or structure), he gets +2 fate, +1 attack. Depending on the card type, there are 3 other potential attributes. Troops and structures have attack / health. Actions have neither. Hero Weapons, have Attack / Armor. How much damage it can take before dying. Note: Your cards don’t heal themselves at the end of turn, like many CCGs. Lets assume the top card of our deck is a 3. When we play this, we will reveal that card, so X = 3. Once the fate draw resolves, we will deal 3 damage to the opponent, and the card we drew as fate (the fate value 3 card), will be moved to our spent pile. That means, that as a general rule, you want to have as high of an average fate value in your deck, as possible, because many actions or abilities, will rely on “drawing fate”, to resolve their value. This adds a huge amount of non linearity and depth to the game, as well as an element of controllable randomness, as there are various ways you can manipulate fate draws, and or work toward stacking your deck with high fate value cards. So if we had a Dark Seer on board, when we played our Dark Energy bolt above, and drew a 3 as the fate value, we instead would have dealt 4 damage. Additionally, the +1 fate is a permanent modifier on the card, so when it gets put into our spent pile and eventually cycled back into our deck, we now have a 4 fate value card in our deck, which we could end up drawing as fate again. Ships and Vehicles are troops, with one condition. They require a Pilot to be attached to the ship, in order to attack or defend. Many Ships or Vehicles will have an ability called “Piloted”, which means that it can attack/defend without another pilot being attached to it. Pilot is an ability found on characters, which simply allows the character to attach to a ship, and add its Pilot X/X amount as attack and health, to the vehicle it is attached to. Additionally, while piloting a vehicle/ship, the pilot cannot be targeted by any opposing weapons, abilities, or actions (unless stated otherwise). Each pilot has a cost: 1, Cooldown: 1, attach to target ship ability, which can be activated while the pilot is readied. Once piloting a ship, the ship itself can detatch up to 1 pilot per turn. There is a lot of strategy and utility in this ability, for instance: a pilot character near death can board a ship, and be untargetable by the opponents weapons, while strengthening the ship it is attached to. It can also be detached once the threats are gone, at which point you have 2 attackers/blockers on board again. 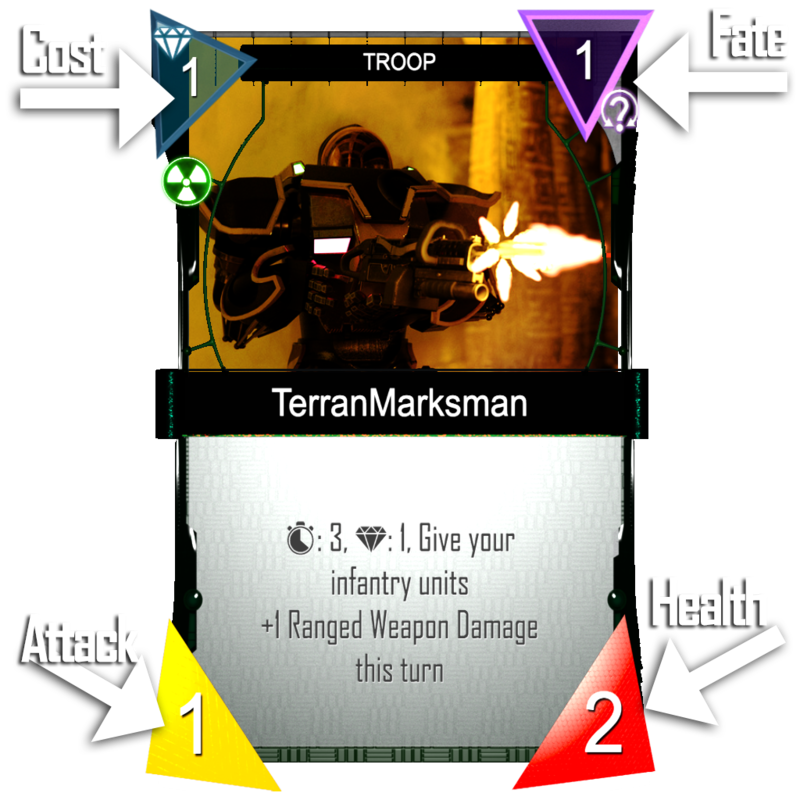 Weapons can provide your troops cards with abilities, and add their attack and health values, to the troop they are attached to. As a simple example. suppose we have a 1 attack, 1 health troop on board. After we attach the weapon above to our 1 attack 1 health troop, it will have 2 attack, 4 health. (additionally it will have +2 fate, due to the weapons ability). Anytime you see the word “host”, it means the card which this card is attached to. Hero weapons enable our hero to attack, and will give our hero armor equal to the armor value on the hero weapon, when played (armor will absorb damage, until it is gone). Once your hero’s armor reaches 0, your hero weapon is destroyed. Your hero attack ability is a cooldown 1 ability which can target any troop, or structure on board. Additionally, your hero attack can target the opposing hero, if they don’t have any troops on board. Often times hero weapons will have an additional “Fire Weapon”, cooldown ability as well. Which means your hero is both able to attack once per turn, as well as Fire their weapon at opposing troops. When your hero gains armor while a hero weapon is equipped, the armor gained will be applied to the hero weapon as well. 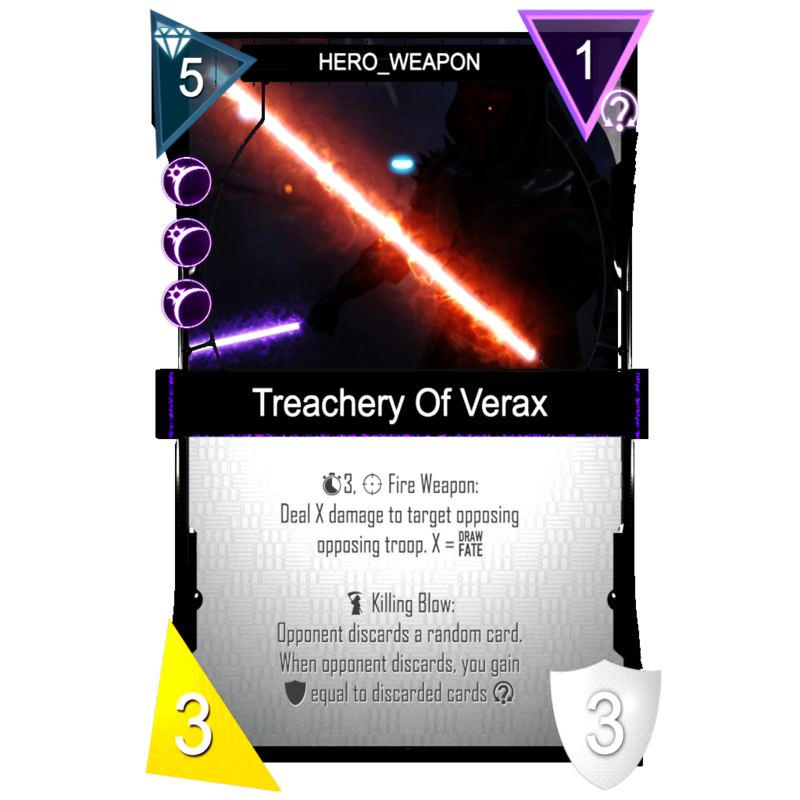 Lets assume we play Treachery of Verax on our hero, for this next example. (note: this next part isn’t a super important core mechanic, feel free to skip it if you feel overwhelmed). Let’s also assume the opposing hero just discarded a card with fate value 3. Our weapon’s ability gives us armor every time they discard, equal to the discarded cards fate value, so we will gain 3 armor (our hero will have 6 armor), and the weapon itself will also gain the armor amount (which isn’t important, yet). Now lets say the opponent deals 6 damage to our hero. Our hero weapon will be destroyed, and moved to our junkyard, but our hero weapon will now have 6 armor. So if we get it back from our junkyard, next time we play it, it will give our hero 6 armor, instead of the original 3. Many card abilities will have a cooldown icon, and say for example, [icon.cooldown] 2: Do something. While an ability is on cooldown, it cannot be used. At the start of your turn, all your ability cooldowns are reduced by 1, and when they reach 0, they ready, and can be used again. So if an ability has [icon.cooldown] 2, it can be used once every two turns. Icon, (or as many other games would say, “keyword”) abilities, are simply abilities which have a specific behavior attached to them. In other games they are commonly bolded, in Dark Matter, they are preceded by an icon. Killing Blow, is an icon ability, which triggers anytime a card deals the last point of damage to another card, which results in its destruction. So, to translate, “When this deals damage to a card, and that card is destroyed, this gets +1 fate”. 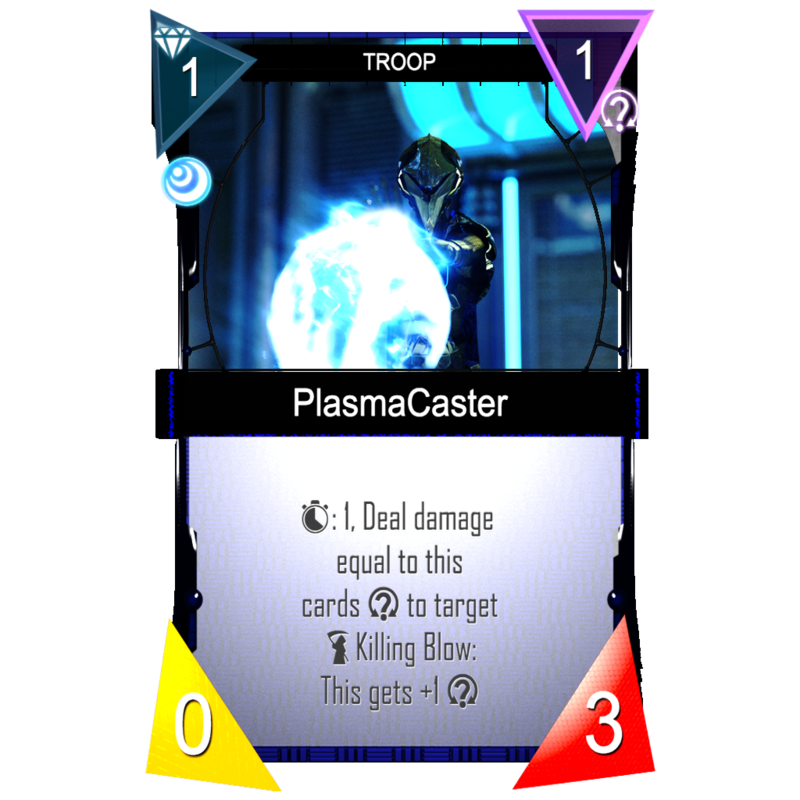 Rest assured that when you hover over this card in game, a tooltip will be revealed, explaining what “Killing Blow” does, so it’s not like you need to memorize what each of the icon abilities. With that said, that sums up all the core mechanics. If you are interested in learning more about the specific icon abilities in the game currently, watch the introduction video (the second video) here http://darkmatter.game/basic-mechanics/ (there will be a text version soon though).